BRETTON WOODS — Work is progressing at Bretton Woods Ski Area on what will be the state’s only eight-passenger gondola. Ground was broken in July on the new gondola, which will be the third in the state (others are located at Wildcat Mountain and Loon Mountain, both of which carry four passengers — a gondola has also been proposed as part of the redevelopment of The Balsams in Dixville. Cannon Mountain operates an aerial tramway that has two cars, each of which holds 80 people). The new lift is expected to be completed for the 2018-19 ski season, said Craig Clemmer, director of sales and marketing of the Omni Mount Washington Resort, owner of Bretton Woods Ski Area and the 1902-built grand hotel across from the ski area. The new eight-passenger gondola line starts in the base area, crosses over the Bethlehem Quad and terminates at the top of Fabyans Triple (which would be slightly truncated). It will feature 17 towers, several of which have been erected. The new lift is approximately 6,000 feet long, climbing 1,300 vertical feet, terminating about 100 feet below the summit of Mount Rosebrook (Rosebrook is the center peak of Bretton Woods’ three peaks — the others being Stickney on the east, or left when facing the mountain, and West Mountain, or Mount Oscar, to the right). The work included the removal of the old B-Lift. The patrol station near the summit of Mount Rosebrook was demolished in July to make way for construction of the new gondola terminal. Uphill speed will be more than 13 mph, with total ride time about 4.9 minutes. The entire project will use more than 500 cubic yards of concrete for the towers, and base and summit terminals. “Work is going ahead, and we’re excited. Once the leaves turn and leave, the snow will arrive, and we’ll be ready for the start of a new ski season with our new lift,” said Clemmer. Clemmer said the new gondola is part of a plan to also build a new mountainside restaurant, with construction set to start in summer 2019 with a completion prior to the start of the 2019-20 ski season. It will total 10,000 square feet, with a smaller restaurant and coffee shop along with skier services on the first floor and a 100-seat restaurant on the upper floor. “We want to take full advantage of that spectacular view across the valley to the Presidential Range," said Clemmer. "It will be located below the ride line. The gondola will offer comfortable, enclosed access. We will have an event lawn up there for concerts, group events and first and foremost for weddings. It will be a great place for dining. It will be for year-round events." He said the ultimate plan for the existing Latitude 44° eatery at the top of Bethlehem Express, located at a lower elevation from the new restaurant, is yet to be decided. 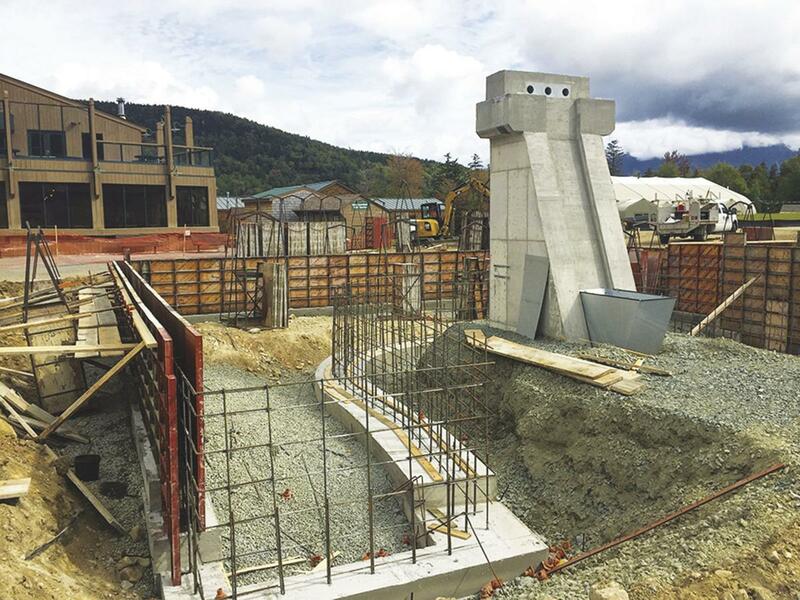 In other projects at the resort, hotel officials recently received approval from the Coos County Planning Board to expand the hotel by adding a four-story addition to increase the number of rooms from 200 to 268. No firm date has been set for construction, resort officials said. t will be built off the existing spa and include a courtyard. “The addition will increase our ability to house more guests, allowing more people to share our unique vantage point of the Presidentials. It would give us an opportunity to let more people have that grand hotel experience,” said Clemmer. For more information, call (603) 278-3320.